Enjoy a unique camping appetizer with these Bacon Wrapped Mozzarella Sticks made over a campfire. Last year, we made bacon wrapped hot dogs over the campfire that were stuffed with mozzarella string cheese sticks. We enjoyed them so much that we decided to explore similar campfire cooking ideas. We came up with these bacon-wrapped mozzarella sticks. This campfire appetizer is really easy to make. You just need some frozen mozzarella cheese sticks, bacon, and toothpicks. We recommend that you soak the toothpicks in some water before using so they don’t burn on the grill. We realize it it has hard to keep things frozen when you go camping but that is no problem for this recipe. You don’t want the mozzarella sticks to be frozen when you grill this recipe, so it is okay for them to thaw out a bit in the cooler. Place the bacon wrapped sticks on the grill over the campfire. Turn the sticks at intervals as to cook the bacon evenly. This appetizer is done when the bacon is fully crisp. You might notice the cheese is starting to pop out of the breading on the mozzarella stick. This camping recipe turned out great. Our only regret was that we only had one small box of mozzarella sticks. I easily ate those by myself. You should get a few boxes because these will disappear quickly! 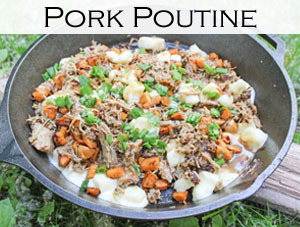 Try this recipe over the campfire the next time you camp or on a grill at home. Please let us know how it turned out and what you think of them. Leave a comment or photo on Pinterest! Create a delicious appetizer with bacon over the campfire while camping or on the grill at home. Soak the toothpicks in water ahead of time so they don't burn on the grill. Start at one end of the mozzarella stick and wrap one to two pieces of bacon around the cheese stick. Hold the bacon in place with toothpicks. Place the bacon wrapped sticks on the grill over the campfire. Turn the sticks at intervals as to cook the bacon evenly. Cook until the bacon is fully crisp. Yuummm ! These look so good ! Yum! Bacon on anything is delicious, so I know these will be good. Pinned and will be featuring it on today’s Merry Monday Party. BTW- have you tried just baking? We have not, but we will do that at home soon. Thanks for the feature.